While Fraemohs Homes is a well-known name to many New Zealanders, you may be surprised to learn that we have also supplied our solid timber kitsets to people and hotels in a variety of different Pacific Island locations. Our Scandinavian-inspired timber cabins are associated by many with alpine chalets and colder climates so it is very fitting that a number of Fraemohs kitsets were used for the 1998 Winter Olympics in Nagano, Japan. However, Fraemohs solid timber kitsets are equally at home in the warm, tropical climates of our neighbouring Pacific Islands. During the 48 years that we have been making solid timber kitsets we have exported them to many Pacific Islands, including Fiji, Samoa and Niue. The award-winning Taveuni Island Resort and Spa in Fiji has found that Fraemohs solid timber kitsets make ideal luxury bures. The solid timber bures are right at home in this beautiful location amongst tropical gardens overlooking the ocean. The solid timber walls are very strong which is an important consideration in a region that can experience tropical cyclones. 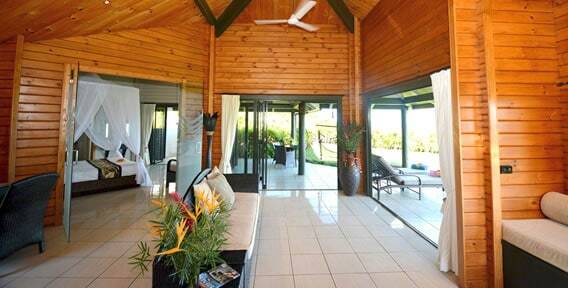 Above: The Taveuni Island Resort and Spa in Fiji has found that Fraemohs solid timber kitsets make ideal luxury bures. The Scenic Matavai Resort on Niue’s south-western coast has also made use of Fraemohs solid timber kitsets for guest accommodation. The apartments have balconies and offer a fantastic vantage point from which to check out the local marine life, including humpback whales, turtles and dolphins. Because Fraemohs kitset homes are very simple for anyone with some basic building skills to construct, they are an ideal solution to building in remote locations. Distance is no object and we have previously sent kitsets to a range of difficult-to-reach destinations including the Chatham Islands and Lord Howe Island, which is situated off the coast of New South Wales.